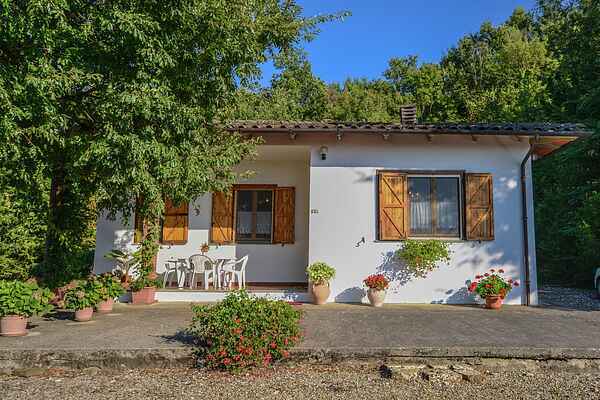 This detached holiday home in San Savino is located in the middle of the beautiful hills east of the Trasimeno lake. You can make use of the enclosed garden (2000 m2) with a partially covered terrace. With views over the lake of Trasimeno, you will be able to enjoy yourself until the early hours of the morning. You can go grocery shopping in San Feliciano or in Magione (both 5 km). The post office, bank and various restaurants are found in San Feliciano. The Lake of Trasimeno has a lot to offer, laze away on one of the sandy beaches or make a boat trip to the islands. Around the Lake of Trasimeno you will find many little villages that are worth a visit; Magione for instance (5 km) where remains of an Etruscan temple and pilgrimage site have been conserved. Here you will also find the 17th century church of Santa Maria di Ancaelle and the 15th century Benedictine abbey of Sant' Arcangelo. These highlights can easily be visited by bike or, Italian-style, by Vespa scooter. You can rent one in San Savino. Larger cities such as Perugia (25 km), Cortona (40 km) and Assisi (55 km) have lots to offer. For golf enthusiasts, there are two 18-hole golf courses available in nearby Perugia.